The give and go, commonly referred to as the “wall pass” in soccer, is one of the most common play you’ll see in all of sports. It’s used to elude coverage and create scoring opportunities and is typically one of the more common plays you’ll see on the field. Also known as the wall pass, so named because when executed correctly, the attacking player will receive his pass back from his team mate as if he had bounced it off a wall. Player 1 will start with the ball facing his team mate and ensure that there is a clear passing lane. The player receiving the ball will have a defender on his back, so it’s important to make sure that the defender doesn’t beat you to the ball, as the whole play will break down and you could create a potential counter attack with your team mate heading the wrong way. 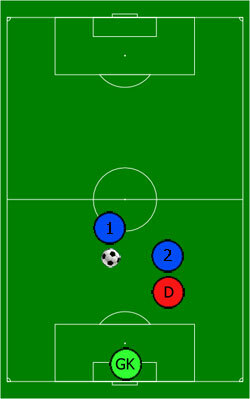 In figure 1, Player 1 has possession of the ball and sees a clear pass to player 2, who has the defender on his back. He makes his pass and then makes his run along the direction of the curved arrow. At this point, make sure eye contact is made, and don’t be afraid to point with your finger to ensure that you’re both on the same page. In figure 2, player 2 is going to wait until just before player 1 is positioned parallel to him, and then make the pass so that the ball is in front of the receiving player, so that he can take it in stride and continue his run. Done correctly, this should be all in one motion, so there is no delay from one the pass is received by player 2, and then given back, therefore giving the illusion that player 1 has bounced his pass off of a wall. 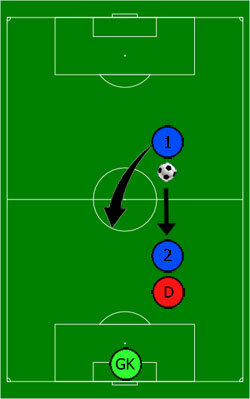 Figure 3 shows player 1 receiving his pass back from player 2. The ball has been placed slightly in front of him, and he is able to continue his run. The timing of this needs to be precise, as if the ball is kicked early, it will in all likelihood be too far ahead of the receiving player and be out of reach. Even worse, if the pass is too late it will either end up behind the receiving player or in their feet, making it impossible to continue the play. Aim to release the pass almost as soon as you get it. Remember, the goal is to create the illusion that the player has passed the ball off of a wall, so return the ball almost immediately.